The Government of the Hong Kong Special Administrative Region (HKSAR) approved in principle the adoption of the Three-Runway System (3RS) as the future development option for Hong Kong International Airport (HKIA) for planning purposes on 20 March 2012, and also approved the recommendation of Airport Authority Hong Kong (AAHK) to proceed with the statutory environmental impact assessment (EIA). An EIA study brief (ESB-250/2012) for the 3RS project (henceforth referred to as the ‘project’) was issued by the Environmental Protection Department (EPD) on 10 August 2012. The EIA report has been prepared according to the EIA study brief requirements, which identified 12 key environmental assessment aspects to be addressed as part of the EIA study. On 7 November 2014, the EIA report for the project (EIA Register No. : AEIAR-185/2014) was approved and an Environmental Permit (EP) (Permit No. : EP-489/2014) was issued for the project. Pursuant to Condition 2.14 of the EP, AAHK shall submit an Egretry Survey Plan (ESP) 1 month before the commencement of construction works at areas with potential to disturb the Sha Chau Egretry. 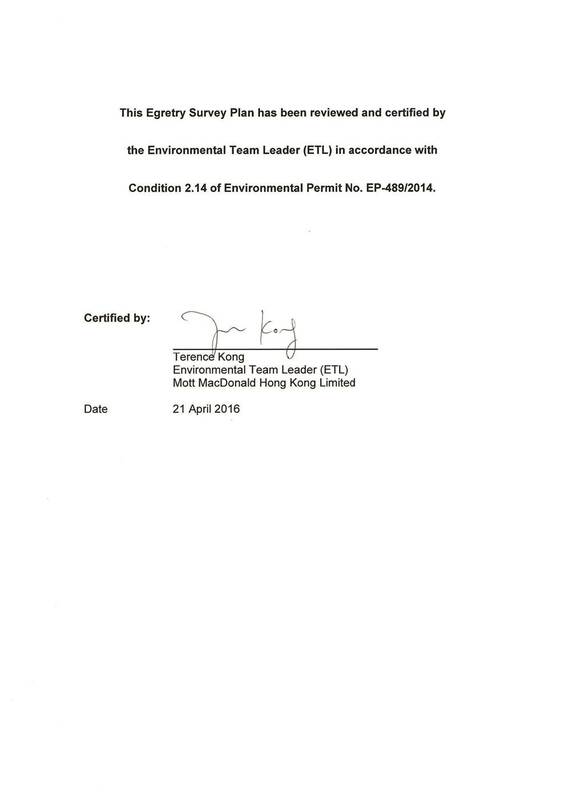 Mott MacDonald Hong Kong Limited (MMHK) was appointed by AAHK to provide environmental consultancy services which cover the preparation of the ESP. ¡ Related airside and landside works, and associated ancillary and supporting facilities. The existing airport island is currently supplied with aviation fuel via submarine aviation fuel pipelines that originate from the permanent aviation fuel facility (PAFF) at Tuen Mun. These pipelines route via the aviation fuel receiving facility (AFRF) at Sha Chau before connecting to the existing aviation fuel tank farm (AFTF) on the airport island. The total length of existing pipelines between Sha Chau and the airport island is approximately 6 km, of which 3 km is located below seabed within Sha Chau and Lung Kwu Chau Marine Park (SCLKCMP). The AFRF at Sha Chau was used as the delivery route for aviation fuel to HKIA from airport opening until 2010, when PAFF came into operation. The AFRF and its twin berths are currently maintained as a backup facility in case of any emergency incidents at PAFF, with these berths ensuring an alternative supply of aviation fuel to HKIA. The PAFF supplies fuel via submarine pipelines to the AFRF and on to the AFTF on the airport island. The planned land formation for the airport expansion will cover part of the existing alignment of the submarine pipelines, and therefore these pipelines will need to be diverted prior to commencement of land formation. To ensure full and proper operation of the aviation fuel supply system in preparation for the implementation of the 3RS, diversion of the existing submarine fuel pipelines from HKIA island to Sha Chau is required and this will be undertaken using Horizontal Directional Drilling (HDD) method as described in the approved EIA report. The HDD works will engineer the approximately 1 m diameter parallel drill holes through the deep rock stratum between HKIA and Sha Chau in order to facilitate the required diversion of the submarine fuel pipelines. Drill heads are planned to emerge (daylight) on the rocky shoreline above the high water mark on the northeastern part of Sheung Sha Chau Island and once the pipelines are installed they will be connected to the existing (AFRF) by pipelines. The originally proposed HDD daylighting location was immediately opposite the AFRF so as to minimise associated pipe connection works. However given the presence of the egretry in close proximity to that location, the proposed daylighting location was shifted further northwards to safeguard a buffer between anticipated works and the egretry as presented in the approved EIA report. Figure 1 presents a location plan of the planned aviation fuel pipeline diversion works. As shown with the latest works programme presented in Attachment II of the Submission of Construction Works Schedule and Location Plans (October 2015), the HDD works is currently planned to commence in the second quarter of 2016. Ardeid’s breeding activities are seasonal, and in Hong Kong mostly occurring from the beginning of April through to the end of July. Construction in close proximity to an egretry may result in some human disturbance and noise that could affect the egretry, particularly if the construction works coincide with the ardeid’s active breeding season. In this case the most likely outcome of such human disturbance would be the shifting of ardeids’ nesting locations within Sheung Sha Chau Island away from the disturbance. The potential for abandonment of the whole egretry is low, however, as there are many suitable habitats available for the ardeids on Sheung Sha Chau Island and the scale of the planned construction works is small, affecting only a relatively small area. Disturbance from the HDD and related construction activities as planned on Sheung Sha Chau have potential impacts in the ardeids’ peak breeding season (April to July) and works activities may affect ardeid’s normal breeding activities during both the daytime and the night-time. The impact was assessed as moderate in the EIA if the proposed construction activities are carried out in the ardeid’s peak breeding season and in the absence of suitable mitigation measures. Mitigations committed to in the EIA were for the construction works at Sheung Sha Chau Island to be scheduled outside the ardeids’ breeding season with no night-time construction work allowed in all seasons. Other mitigation measures including construction phase monitoring would also be in place to minimize potential impacts on the egretry. These mitigations are also effective therefore in regard to the potential impacts to nocturnal species, i.e. the Black-crowned Night Heron. In Hong Kong, the status and location of egretry can change from time to time even in the absence of human disturbance. Therefore, a pre-construction survey was recommended in the approved EIA Report and particularly in Section 9.2 of the Environmental Monitoring and Audit (EM&A) Manual to update the latest boundary of the Sha Chau egretry during the breeding season before commencement of the HDD drilling works. The survey updates the boundary of the egretry with a view to confirming the daylighting location. Subject to the pre-construction survey findings, the daylighting location/ works area may need to be adjusted to avoid egretry location in case the boundary shifts towards the currently identified daylighting location. ii. the survey works shall be conducted by qualified ecologist with at least three years’ experience on Egretry monitoring. This ESP reports the result of the pre-construction surveys, which were conducted between April and July 2015 and updates the boundary of the Egretry based on the results. According to the approved EIA Report, the concerned egretry is located at the eastern part of Sheung Sha Chau Island, as shown in Figure 2. The Sha Chau egretry is monitored by the Hong Kong Bird Watching Society (HKBWS) as part of the Egretry Counts Programme, a field monitoring programme commissioned by the AFCD. The egretry counts performed between May and June 2011 revealed that Sha Chau supported 56 nests of Little Egret, which was the highest count among all surveyed colonies that year (Anon, 2012a). Two nests of Great Egret and six nests of Black-crowned Night Heron were also recorded (Anon, 2012a). The number of nests on Sheung Sha Chau Island increased in the summer of 2012. The monitoring of the egretry conducted between April and July 2012 identified that the number of nests of Little Egrets increased from 56 to 69, which was the highest number among all colonies of the same species in Hong Kong. The number of Black-crowned Night Heron nests also showed an increasing trend from six in 2011 to 22 in 2012 while that of Great Egret remained unchanged (Anon, 2012b). The egretry monitoring programme continued in 2013; the results showed that the number of Little Egret nests dropped from 69 to 40, Great Egret nests increased by one, whilst Black-crowned Night Heron increased from 22 to 40. In 2013, Sha Chau egretry was the second largest egretry in Hong Kong (Anon, 2013). During the egretry survey conducted in 2013 for the 3RS EIA study, a maximum of 97 ardeid nests comprising 61 Little Egret, 5 Great Egret, 28 Black-crowned Night Heron and 3 Pacific Reef Heron nests were observed and it was found that the most active breeding activities happened between April and May. The AFCD field counts programme continued in 2014 and the numbers of nests of Little Egret, Great Egret and Black-crowned Night Heron in Sha Chau egretry all declined in 2014, with 35 nests of Little Egret, 2 nests of Great Egret and 15 nests of Black-crowned Night Heron present (Anon, 2014). In accordance with the EM&A Manual, the egretry survey was conducted once per month between April and July 2015. All the surveys were conducted in early morning (around 7:30 am to 9:30 am) to meet the most active period of the ardeids. Each survey lasted for more than one hour. The survey programme is given in Table 3.1 below. The survey was conducted at a survey location with open and unobstructed view over the egretry at the lighthouse just in close proximity to the egretry, as shown in Figure 2. During the survey, the egretry was scanned by the surveyors using binoculars. All active nests were identified and recorded. Aside from bird nests, any activities related to breeding behaviour, such as nest sitting and chick feeding, were also recorded as a field note in the datasheet. The field scan was repeated at 30 minute intervals to inspect the whole egretry area and its proximity. The number of ardeids/ nests of the egretry were determined as the maximum number of ardeids/nests counted during the survey. The survey was followed up with a close up observation during which the surveyors used a boat to inspect the areas that cannot be fully observable at the survey location. The surveyors did not land on the egretry area in order to minimise any disturbance to the ardeids. An audit by the project’s Independent Environmental Checker (IEC) was conducted on 1st April 2015, which confirmed that the surveys were being conducted according to the planned methodology. During the survey, the species composition and abundance of the ardeids community was recorded. The number of nests and number of ardeids were counted in each of the field surveys. In the event that nests were not directly seen due to thick vegetation, any breeding activities, such as nest sitting and chick feeding, were recorded and considered as the presence of nest. The number of ardeids and the number of nests were counted each month. The data sheet used for recording field survey findings is provided in Appendix A. Based on the locations of the nests, the boundary of the egretry was depicted on a map. The boundary has covered all the active nests locations recorded in the survey. As required under the EP, the survey was conducted by qualified ecologists with at least three years’ experience on egretry monitoring. The CVs of the surveyors is given in Appendix B with their experience on egretry monitoring highlighted. The pre-construction egretry survey was conducted between April and July 2015 according to the schedule shown in Table 3.1. The survey findings revealed that the breeding species community involved is same to that identified in previous years which mainly comprises of Little Egret, Great Egret and Black-crowned Night Heron. The peak count of birds and nests in the surveyed months are presented in Table 4.1. * - The record of one Pacific Reef Heron nest is based on observation of three juveniles in June. Amongst the three main breeding species, the Black-crowned Night Heron tends to breed slightly earlier than the other two breeding species and during this survey, it was noted that some Black-crowned Night Heron juveniles were already able to leave their nests, whilst Little Egrets and Great Egrets were just nesting or incubating. As this egretry survey has shown that the egretry boundary has shifted further away from the proposed HDD daylighting location (see Section 4.2 below), there is no particular concern of direct impact on the egretry, however the potential effect to the egrets and herons will need to be monitored during the construction phase. As described in the EM&A Manual, ecological monitoring shall be undertaken monthly at the HDD daylighting location on Sheung Sha Chau Island during the HDD construction works period from August to March. Table 4.2 below summarises the nest numbers of ardeids on Sha Chau egretry between 2011 and 2015, which shows the figures in 2015 are comparable to previous years with slight increase of total nest number when compared to the 2014 figures. * - Data source: Anon (2012a, 2012b, 2013 and 2014).
. Pacific Reef Heron usually breeds on ground, cliff ledges, but it was found breeding in Sha Chau Egretry in 2013. Its nest is difficult to observe as it was not built on trees. Observation of fledglings in June strongly suggests successful breeding in this year but the actual number of nests could not be confirmed. The egretry boundary is defined as the boundary which covers all ardeid nests. Based on the survey findings, the boundary is depicted in Figure 3, whilst a comparison of the boundary between 2013 and 2015 is provided in Figure 2. Compared to the boundary observed in 2013 EIA study, the latest boundary is of similar size but has shifted further southwest of the boundary identified in the EIA. It is of particular note that active nests were observed immediately opposite to the AFRF in 2013 but in 2015 the nearest nest is at least 50m to the west of AFRF. Based on the survey findings, the egretry boundary in 2015 has shifted further away from the planned daylighting location as proposed in the EIA report. The target daylighting location is provided in Figure 3 and it has been situated as far away from the egretry boundary as practicable and within the recommended area of the EIA. It should be noted that the exact daylighting location may change subject to detailed design and construction as built. The size of the daylighting location has now been kept to a minimal as per the EP Condition 2.14 requirement and has been designed not to exceed 10m x 10m as recommended in the EIA Report. The updated egretry survey has identified that the boundary of the egretry tends to move southwest and further away from the proposed daylighting point. 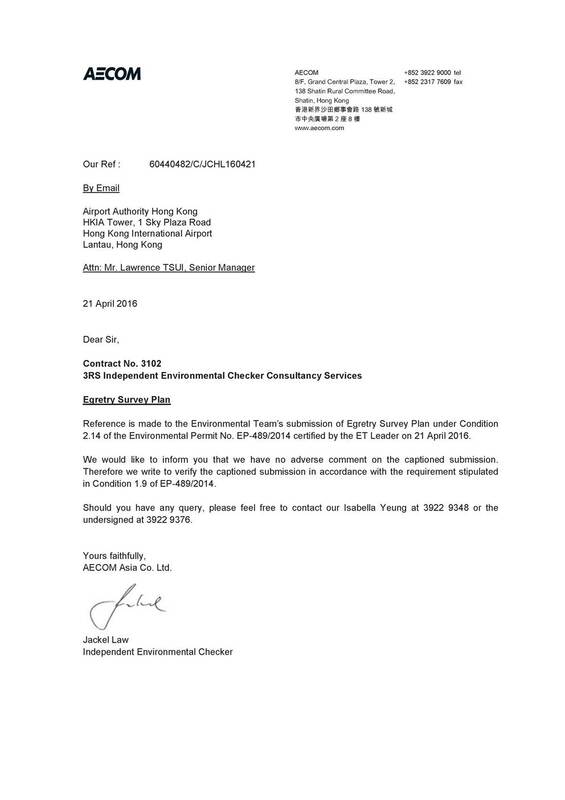 Hence, the daylighting location and mooring of flat top barge will not encroach into the Sha Chau Egretry in accordance with EP Condition 2.30. This Egretry Survey Plan, which was prepared in accordance with EP Condition 2.14 and the requirements described in Section 9.2 of the EM&A Manual, has reported the findings of the pre-construction egretry survey conducted in April, May, June and July 2015. The survey results show that nest numbers in 2015 are comparable to previous years with a slight increase in total nest numbers compared to 2014. The survey has identified that the egretry boundary has shifted further south and west of the boundary identified in the EIA. The EIA report has made the commitment that the final daylighting location for HDD may be subject to further adjustment to avoid direct encroachment on the egretry. The updated egretry survey has identified that the boundary of the egretry has in fact moved further away from the proposed daylighting point and therefore direct encroachment on the egretry to the breeding ardeids due to the daylighting for HDD and mooring of flat top barge can be avoided. However, indirect disturbance to the breeding ardeids will need to be minimised and monitored in accordance with the EM&A Manual. Mitigation measures to be undertaken to minimise indirect impacts on the breeding ardeids include confining artificial lighting within the site, covering/camouflaging the containment pit at the daylighting location, no felling of trees at Sha Chau, no construction works at night-time as well as between April and July, with reference to EP Condition 2.30. Ecological monitoring shall be undertaken on a monthly basis at the HDD daylighting location on Sheung Sha Chau Island during the HDD construction works period from August to March. Anon. (2012a). Summer 2011 Report: Egretry Counts in Hong Kong with particular reference to the Mai Po Inner Deep Bay Ramsar Site. Report by The Hong Kong Bird Watching Society to the Agriculture, Fisheries and Conservation Department of HKSAR Government. Anon. (2012b). Summer 2012 Report: Egretry Counts in Hong Kong with particular reference to the Mai Po Inner Deep Bay Ramsar Site. Report by The Hong Kong Bird Watching Society to the Agriculture, Fisheries and Conservation Department of HKSAR Government. Anon. (2013). Summer 2013 Report: Egretry Counts in Hong Kong with particular reference to the Mai Po Inner Deep Bay Ramsar Site. Report by The Hong Kong Bird Watching Society to the Agriculture, Fisheries and Conservation Department, Hong Kong Special Administrative Region Government. Anon. (2014). Summer 2014 Report: Egretry Counts in Hong Kong with particular reference to the Mai Po Inner Deep Bay Ramsar Site. Report by The Hong Kong Bird Watching Society to the Agriculture, Fisheries and Conservation Department, Hong Kong Special Administrative Region Government.